One sure way to get me away from my sewing room is TRAVEL. Sometimes, however, there is a lot of sewing that happens before that travel commences. The impetus to the creation of my recent fancy dress was, indeed, a recent trip to Los Angeles, California, which was part business for my husband and pure pleasure for me. The lovely hotel where we were staying was actually in Beverly Hills, at the intersection of Wilshire Boulevard and Rodeo Drive. For those of you unfamiliar with Rodeo Drive, it is one of the most exclusive shopping areas for fashion and jewelry in the US. Although I am not much of a shopper at home – either window shopping or real shopping – it is quite a pleasure to do just that while on vacation. 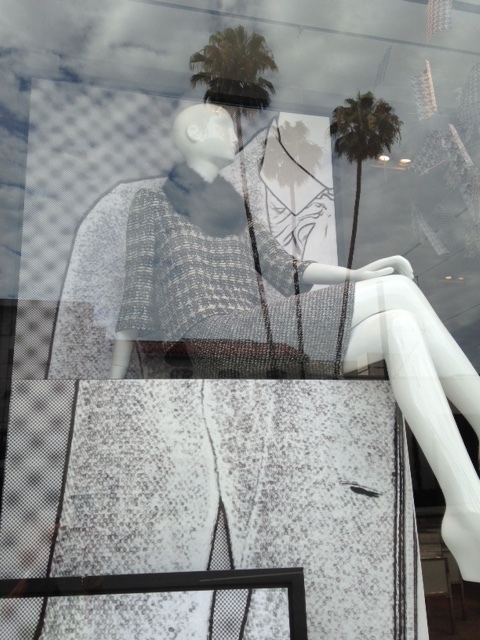 The reflection of palm trees in the window obscures some of the fashions, but I love this understated, but sophisticated look. 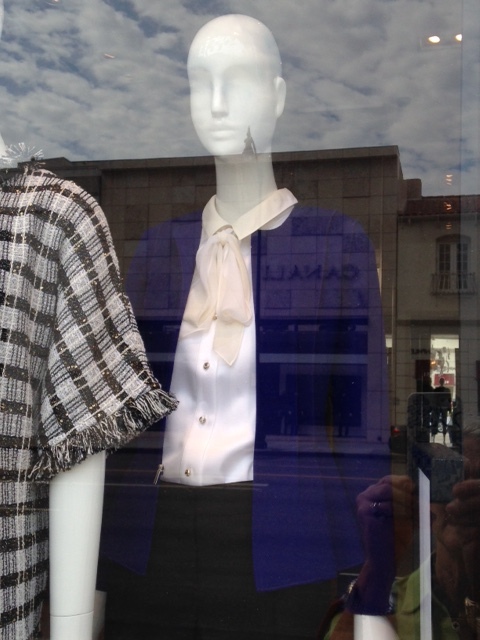 And what could be more classic than this jacket and blouse with a bow, also St. John. … and a back view. The V-back is just lovely! Later in the day, I was captivated by some of the fashions I saw in some of the stores, especially Dolce and Gabbana and Hermes. Unfortunately photos were not allowed, so I cannot show you the classic princess lined coats and lace dresses in Dolce and Gabbana made from fabrics which were either identical to or close relatives to some pique and lace that Mendel Goldberg carries in their store in NYC. And Hermes had a color-blocked coat that looked right out of the early 1970s. 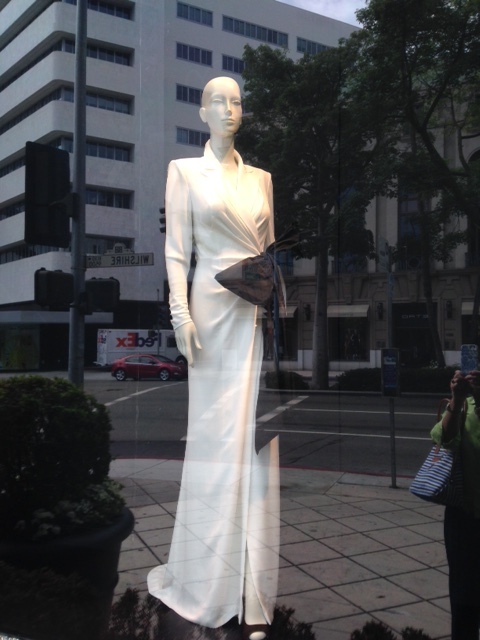 One excursion I wanted to make while we were in LA was to the museum of the Fashion Institute of Design and Marketing. I follow their blog, which regularly features items and fashion from their permanent collection, from all time periods. 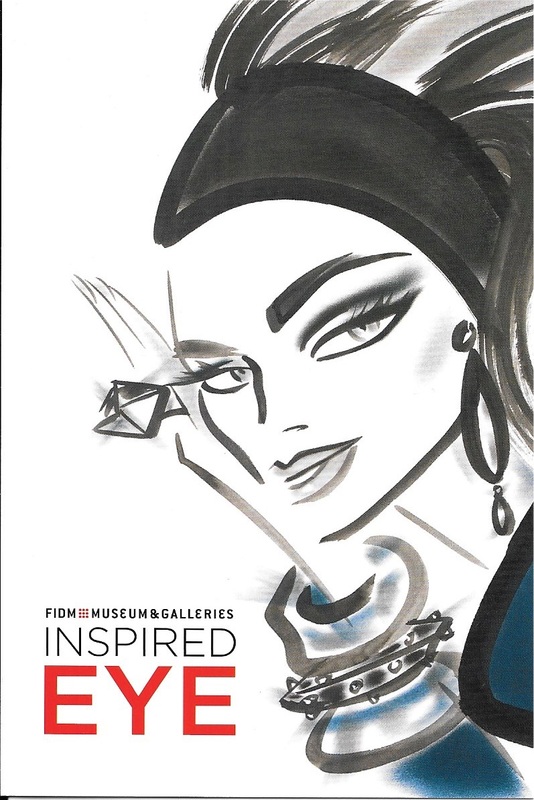 They have two small exhibit spaces which were currently featuring items from the Helen Larson Historic Fashion collection in one gallery and “Inspired Eye” in another gallery. Inspired Eye is an exhibit of items from the Donald and Joan Damask Design Collection. The exhibit includes classic photographs as well as accessories and items of apparel. 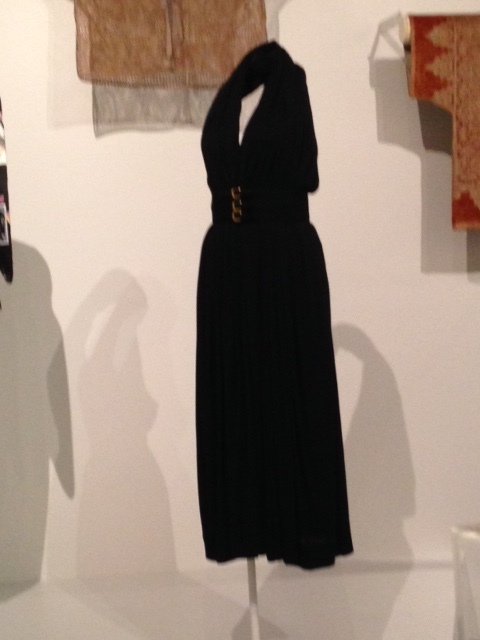 It was fun to see this Claire McCardell dress, circa 1950, looking every bit as fashionable now as then. Of course, for me, one thing I was looking forward to was the event to which I could wear my new fancy dress. As luck would have it, our camera was acting up for some unknown reason, so my husband had to resort to his iPhone for a couple of pictures of me wearing it. One thing was certain – no one else at the party was wearing anything quite like it! Our trip continued up to northern California, where we spent a few days with our son and his girlfriend, and which also included a trip to Britex Fabrics in San Francisco, where I picked up a few choice notions and buttons. Now we are home and a new project is strewn out in my sewing room, asking for attention before TRAVEL once again will wisk me away. It’s a shame you didn’t get a chance to visit the fabric district in downtown LA while you were here. 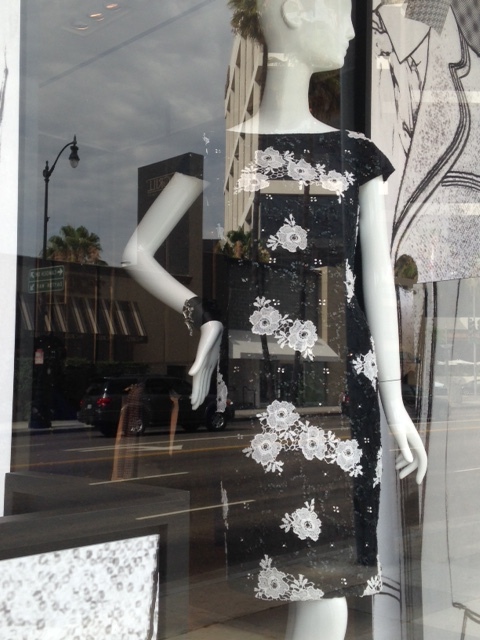 Actually, I knew the fabric district was only a couple of blocks away from FIDM, but we had limited time – and also, my husband was kind enough to come with me to the FIDM; I didn’t want to make him go fabric shopping with me, too! Your dress is just adorable and beautiful at the same time! I know you had a great trip – I’d love to shop at Britex sometime! Thanks, Sarah! I was in button heaven while I was there – it was difficult not to buy buttons that I had absolutely no use for! And of course, that’s just one of the charms of Britex! It’s lovely to see the finished dress after so much work! Your trip sounds wonderful. It was a lot of work! But wearing it was definitely a highlight of the trip. Thanks so much for your comment! Your dress is magnificent! Thanks for the photos from your window shopping. I did the same thing in Paris last Christmas Day; loads of inspiration and no shopkeepers annoyed I was taking photos. Sounds like a wonderful trip! Thank you, Mary. I so wished I could have taken photos in some of the stores – some of the fashions were exquisite. You look wonderful in your dress! It will be interesting to see if LA inspiration will influence your sewing choices in the coming months. Have a nice summer and enjoy your travels! Thanks, Marianne! I was so inspired to see such classic styles on display in these tony stores! What a gorgeous dress! You look lovely (and the yellow is so nice). Thank you, Jen – I am so glad I chose the yellow! Your dress is absolutely outstanding!! The white lace is gorgeous and I’m sure you had the most beautiful dress at the event. Thank you, Jackie! 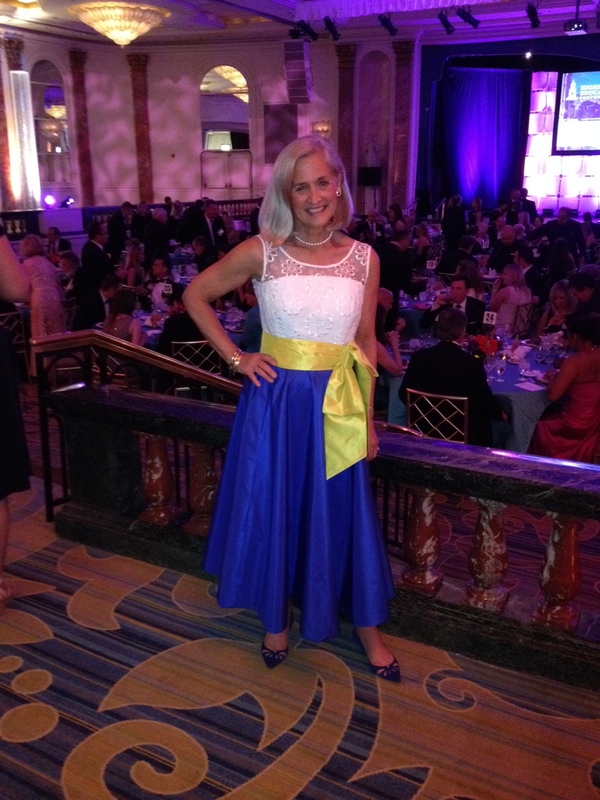 It’s so much fun to get all dressed up – and this was the dress to use for the occasion! You look exceptionally gorgeous (and proud) in your dress. Incredible job, as usual. Thanks, Cissie! I was glad to have the dress finished – and happy with how it turned out. Sounds like you had a wonderful trip to Los Angeles! Your dress is amazing as well, it should be in one of those windows! Oh, thank you! It was a fun trip and quite a change from life at home! Your dress is fantastic, and you look beautiful! 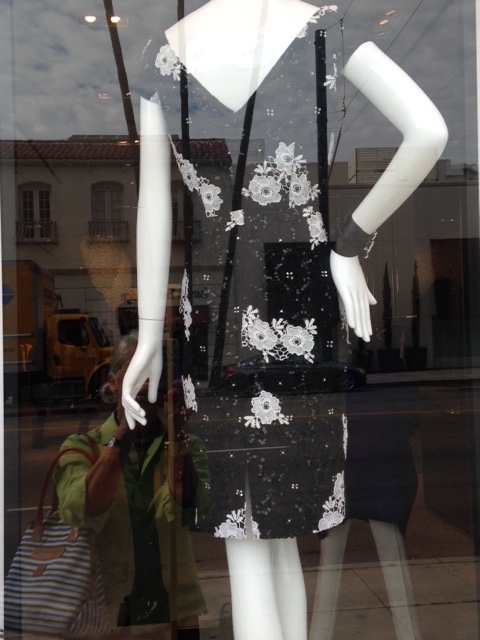 And what fun window shopping in that tony neighb. I would have loved to see that McCardell. Was it knit jersey or woven? Thanks for the blog shoutout by the way. Hm-m-m-m, I think it was woven. I immediately thought of your dress when i saw it in the gallery. Thanks, Julie – and you’re welcome! Lovely inspiration pictures and the thing I most like about your party dress is the subtle way the white lace works at the top. Excellent. Thanks, Kate! I didn’t want anything too fussy in the way of lace, so I was pleased with the effect the embroidered silk organza made. Looking at what is in the stores is always such an inspiration for me too! 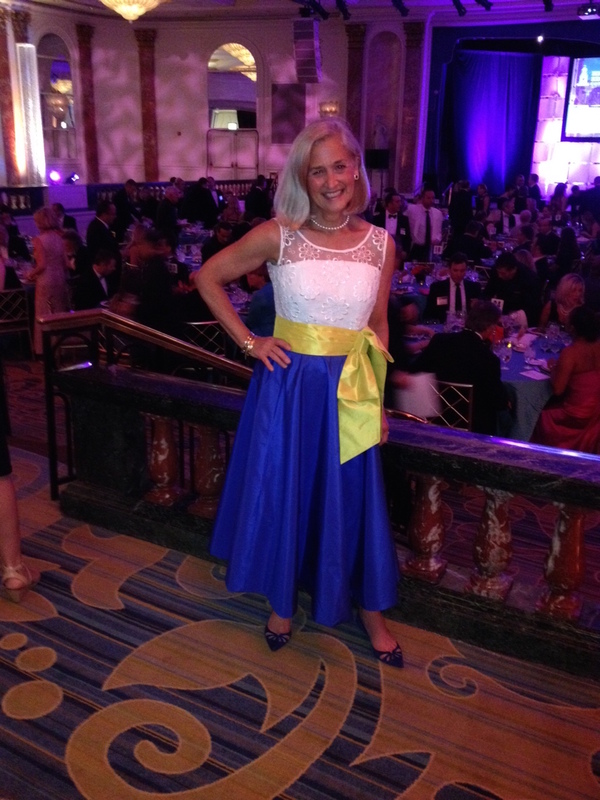 The boldness of your dress – white, yellow and blue is fantastic! Thanks, Linda! I find it so much fun to look at gorgeous fashions in expensive stores – and then know that I can probably make my own renditions of what I see. Sewing is a great gift! What a classic look! So lovely! Beautifully made and worn. My first comment is still awaiting moderation? I promise I’m not a spam bot. I enjoy reading this blog. Thanks so much for following up with me. I’m delighted that you enjoy my blog! Thanks for reading! So gorgeous! What fun to have not only the ability to make such a stunning garment, but an occasion to wear it! It surely could be in a boutique window! Or walking the red carpet! Thank you, Marguerite! It’s not often we get all fancied up for an evening, but it is sure is fun to do – and the perfect excuse to make a dress like this one. You look fabulous, and so does that beautiful dress. Thanks for sharing your window shopping.